Almost anyone who was anyone in British history for the last thousand years has been interred within the grounds of Westminster Abbey. Its importance is evidenced by its location – right opposite the Houses of Parliament, where its two Gothic towers stand guard on behalf of the monarchy – for this abbey belongs to the Queen, not to the organised church. 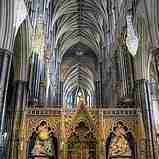 The best way to experience this ancient home of glorious religious tradition is to attend a service here. Even if you're not a religious soul the sometime serene and sometime passionate ceremonies are powerful enough to remind confirmed atheists of the value of religious tradition. And it's the only way to get into the Abbey for free. Unlike some famous churches you don't need to book your place at the service you'd like to attend – but it helps if you turn up early – especially if you want to attend a Sunday service. Unlike other famous churches you're not asked to pay to attend a service, although they do pass a plate around on Sundays with the money going to various charities – you'll know where your money's going though, they'll tell you on the day and it will potentially relate to the themes of the service that's given. There's not an official dress code, but it's appreciated if you respect the fact that this is a house of God. If you need to recharge your spirit during the week you can attend Mass before work – Westminster celebrates Morning Prayer at 7:30am, Holy Communion at 8am and 12:30pm and Evening Prayer at 5:30pm. On weekends they begin a bit later with Holy Communion at 8am. On Saturday it's Morning Prayer at 9am and Evensong at 5pm, and on Sundays they have a Choral Martins at 9:30am, at 11.15am there's a Sung Eucharist, Evensong is at 3pm and the Evening Service at 6:30pm. On Sundays there are also usually organ recitals in the afternoons. You can check the calendar here, and it's best to check before you visit, because different services are held in different chapels and it's a big church. Westminster Abbey also holds all sorts of additional special services for special days in the church's calendar, or in that of the nation, and memorial events for well known citizens. These sorts of services are held in both the Abbey Church and St Margaret's Church and if you want to attend them you'll need to contact the abbey and arrange a place. Like many of London's churches, Westminster Abbey also has regular lunchtime music concerts and there are many weekly organ recitals. Some of the most inspiring religious experiences are set to music, and people have sung their praise and thanks to God in this abbey every day for the past thousand years, from 10th Century Monks via some of Britain's best known composers and musicians to the 30 boys and 12 adult singers in the modern choir – how's that for tradition. If you enquire nicely you might even be able to establish what time the choir will be rehearsing. After you've experienced the church in the way it's meant to be you might want to see some of its famous sights. Most people know of Westminster because it's where the British monarchy have their coronations and are interred, so some of the highlights of the grand tour are the royal tombs. One of the best ways to tour Westminster must be on a Verger led tour, which can be arranged for small groups and families and last for 90 minutes, including a visit to the Shrine, which is where Saint Edward the Confessor is buried, the Royal Tomb, Poet's Corner, the Cloisters and the Nave. If you want to take your own time, or you're looking to pay your respects at a specific tomb or memorial – like Sir Isaac Newton, Charles Darwin, Jane Austen, Samuel Taylor Coleridge, Kipling, Wordsworth or Tennyson – then you can still have your knowledge of the abbey augmented by Sir Jeremy Irons: who does the voice over for the audio guide that comes free with your entry ticket. Why? This is what churches are made for.